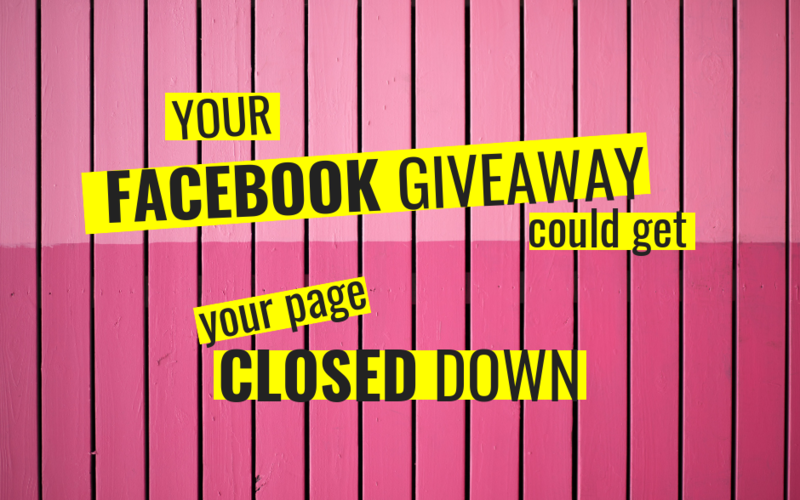 Your Facebook Giveaway Could Get Your Page Closed Down! We’ve all seen those competitions on Facebook where you have to tag a friend or share a post to enter. Often they have thousands of comments and shares, regardless of the prize, and they look like a great way to get your business seen. But, if you are running these kinds of competitions on your business page you could be risking your entire social media presence. Facebook have very strict rules when it comes to running competitions and giveaways and if you are found to be in breach of them they will close your page down. No warnings. No second chances. No opportunity to get it back. If tagging a friend is a condition of entry then you are in breach of Facebook rules. But it’s a great way to get more comments and more eyes on your business so it’s really tempting to do. Facebook is very serious about its users privacy so asking people to share a post, especially if you are insisting it is on a public post, is a big no no. Of course sharing is another great way to get more eyes on your post and you can ask people to share any of your posts EXCEPT if there is a prize involved. So be strategic, make sure your giveaway is naturally sharable so people WANT to share it. If you want your page likes to increase then giveaways are a great way to do it! But it can seem really demanding and might put people off from entering. You can still gain new followers without having this as a condition of entry simply by reminding people that they can follow your page for giveaway updates or other news. Before picking your condition of entry, it is important to understand why you are running a giveaway at all. Is it to get user generated content to use on your social channels in future? Is it to get customer feedback? Do you want more traffic to your website? Or do you simply want to increase brand awareness? You must include detailed giveaway rules – this can be in a link to a landing page. Similar rules apply to running competitions on Instagram, Twitter & LinkedIn so do check before jumping into running any giveaways. So, if you don’t want to risk your business page make sure you check the rules regularly. If you are unsure of where a giveaway or competition fits in with your marketing strategy, I am here to help. Drop me an email to book a call.